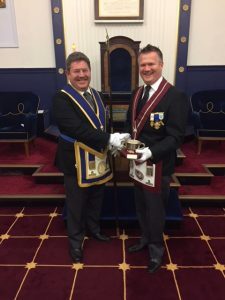 At the Charles Lyne Lodge of Installed Masters meeting last Thursday, part of the itinerary was to present the Director of Ceremonies cup. This cup is awarded to the Lodge Director of Ceremonies who has shown excellence throughout the year within his Lodge and the after proceedings. Below is pictured Worshipful Brother Paul Wadsworth who without doubt fully deserved the award. Her W. Bro. Paul is being congratulated by W. Bro. 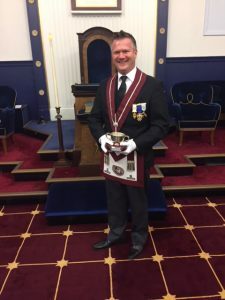 John Judd, the Provincial Grand Director of Ceremonies and also a member of the St Johns Lodge. 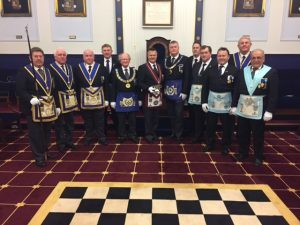 Previous Postjasper tudor lodge maintain their reputation as charity champions!Next PostWhich came first? both from the great war.